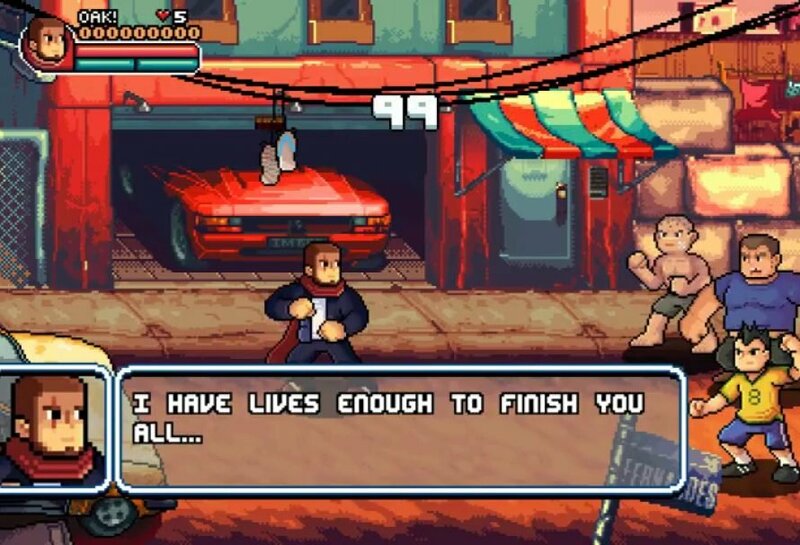 “99Vidas” is a fun retro-inspired beat ’em up that pays homage to classics like Streets of Rage, Double Dragon, & Final Fight. 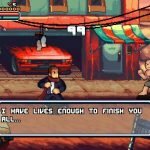 99Vidas is a pixel graphics indie beat ’em up created to pay tribute to the classics of the 80s and 90s. It has beautifully designed animation, catchy music, is packed full of references, and is a very fun game-play. The journey consists of 6 stages filled with ruthless enemies and brutal bosses. As you progress on your adventure in breaking faces, you get to upgrade your combos. You can go alone, but its dangerous. You can also play online with up to 4 players, and there is a versus mode. I’ve always been a fan of a good beat ’em up game, but in recent years I haven’t come across to many that have impressed me. I tried Double Dragon: Neon the other day and just wasn’t feeling it. Maybe I just needed some retro-style 16-bit action to get me back into the genre. I’m happy to say I’m very impressed with this game. I absolutely love the style of animation. It reminds me of Steven Universe in a action game, where they left out Steven and the crystal gem crew. The characters are cutesy, but deadly. I don’t think I’ve ever played a beat ’em up game without finding it gets repetitive the longer you play. This game is no exception, but I think the unlockable combos help keep you captivated. Besides the awesome animation and adorable arse-kicking characters, the music is very catchy. The story line is pretty cool to if you pay attention. The developers obviously have an odd sense of humor. Adding the RPGish element is a nice touch. I think this game is very fun and creative. It does an excellent job of paying tribute to the classics of the 80s and 90s with its many references. The animation and comedy aspects keep you wanting more. Its kind of a short game, but I don’t like this style of game to go on forever anyway. I really only have good things to say about this game. If your a fan of classic beat ’em up games then I recommend this one. On Steam surprisingly it only got a positive review. I’d say it teeters on being in between Very Positive and Overwhelmingly Positive. We all like different kind of games. This game might not be for everyone, but I think it covers all the bases you’d want it to and more.